“So what? What difference does it make?” became Harris-Perry’s theme for the evening as she delivered a keynote speech as part of the “Faces of Courage” yearlong celebration of the decision by the Board of Trustees in 1962 to integrate the University. It was when she struggled that Harris-Perry met then-University Chaplain Edgar D. “Ed” Christman (’50, JD ’53). She didn’t know at the time about his commitment to self-governance, tolerance and democratic principles. “All I knew was that I felt bad, and he had an open door,” she said. Harris-Perry connected this story to the role of education and the role that individuals, especially young people, have as citizens. “This question, and asking this of yourselves and of your political process, is the consistent gift that we give to democracy,” she said. 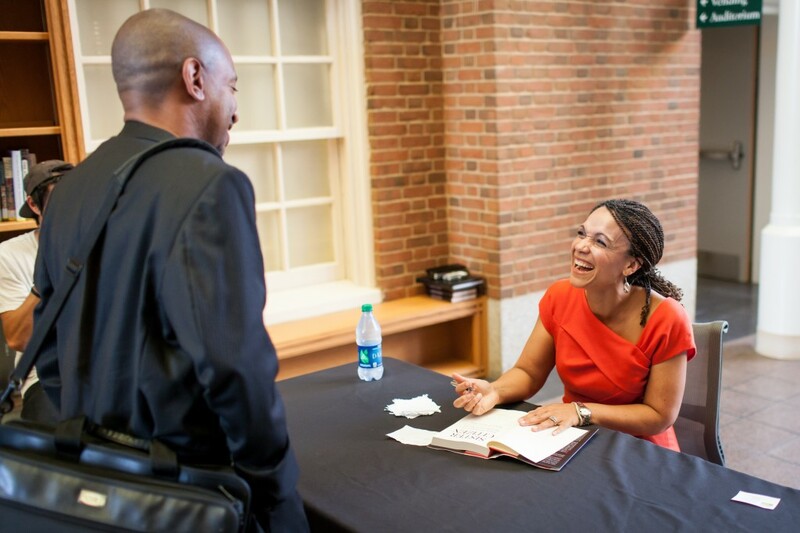 The political commentator whose weekend talk show is called “Melissa Harris-Perry” made sure to focus briefly on the presidential election in her speech in Wait Chapel. “Don’t miss that this thing is happening,” she told students.